This section lists the errors you may encounter when trying to access your Oro application, and the solutions to help you log in. 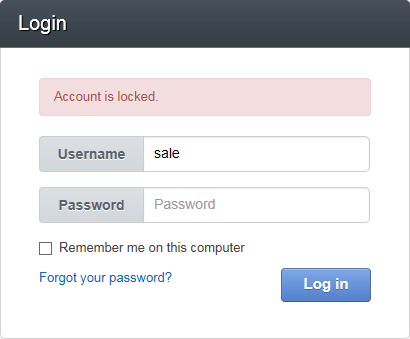 The Account is locked notification means that your account has been disabled in the system. You can no longer log into the system and other users cannot engage you in business activities. If you are sure that this is a mistake, please contact your administrator. Check your email box for the password reset link. You will be able to log into the system after you change your password. You have provided wrong credentials. Make sure that the credentials you are entering are correct and try again. Please check if you are in Caps Lock mode or have the wrong language setting on your keyboard. The password policy of your organization gives you a limited number of login attempts. You have entered the wrong credentials but you still have some attempts left. 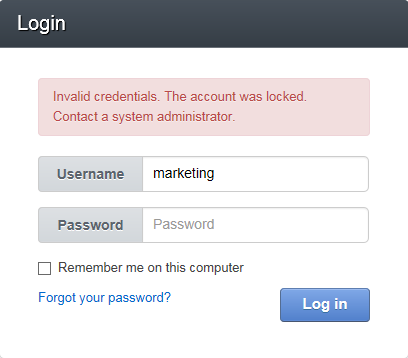 You account has been locked because you have reached the maximum number of failed login attempts. Other users can still engage you in business activities. Contact your administrator to reactivate the account.